I’ve recently returned from England where I stumbled upon a great example of Muslim-Christian partnership at work. 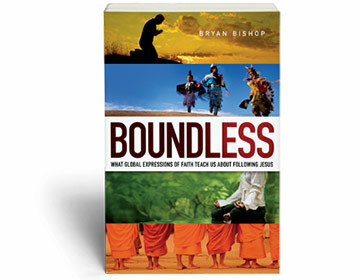 As I mentioned in Boundless, I believe that if believers in Jesus genuinely desire to learn from the cultures around them, they will discover ways to team up with people of other faiths. The church I visited in London was a perfect example of that. I showed up at St Paul’s Shadwell unannounced, as usual. I come to England often on Youth With A Mission (YWAM) business, but I’m never sure if I will have free time on the weekends, so my train trips to St Paul’s are usually arranged at the last minute. When I walked into the foyer this Sunday, I happened across my friend Louie Thorpe, the wife of Ric Thorpe, rector of St Paul’s. She was happy to see me. We’ve been friends for more than 25 years, ever since we went through YWAM’s Discipleship Training School together. Through her, I got to know Ric. I visited the two of them first at Holy Trinity Brompton, shortly after they got married, and where Ric served as one of the pastors. 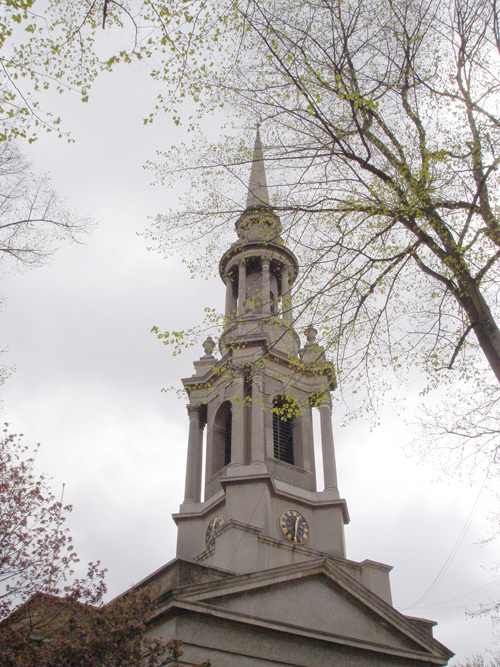 Holy Trinity Brompton, an Anglican church near Buckingham Palace, has become famous for the Alpha program, which they developed to help unchurched people explore biblical faith. That program has spread all over the world. My own aunt and uncle were impacted by the program in their church in Canada. Holy Trinity Brompton also has a vision to revive the Anglican church in England. With the blessing of the Archbishop, leaders of the church contact other Anglican churches that are in danger of dying, with maybe just a few elderly people in attendance, and make arrangements to bring the church back to life. They send one of their pastors and about 50 young people over to restart the church. That’s what Ric and Louie were preparing for when I met them over at Holy Trinity Brompton, and it’s what actually took place. They ended up at St Paul’s church in Shadwell, a formerly working class area near the Thames that now has been redeveloped with condos for young professionals from the financial district. The historic church, which was once attended by Thomas Jefferson’s mother, now also sits across the street from a Bangladeshi immigrant community. When you go to St Paul’s by the underground, as I do, you get off in the middle of that Islamic neighborhood and walk past a fish market and corner stores with signs in Bengali script. Ric and Louie wondered how to meet the needs of such a disparate community, one that contained older blue collar families, wealthy young singles, and Muslim immigrants. In particular, they admitted not knowing much at all about how to reach out to the Muslims. A couple of young families that joined them in the church plant planned to live in apartments in the Islamic neighborhood, and they were praying about what kind of needs they could meet. That was back in 2005. Fast forward to my visit a few weeks ago. 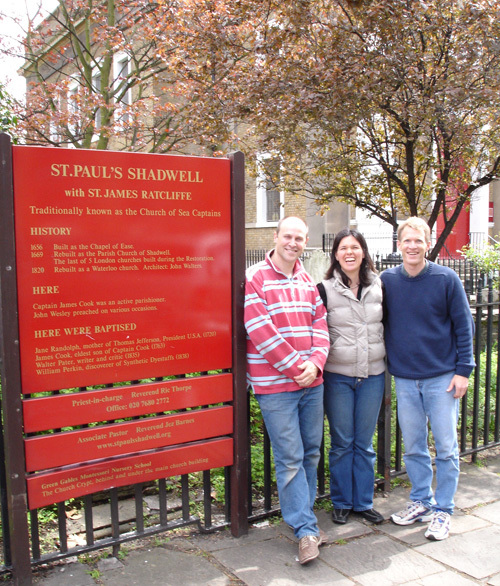 By now, St Paul’s Shadwell has grown into a thriving community with three services each Sunday. They have also sent off pastors and members of their congregation four times, reviving four other Anglican churches. One of those churches is already preparing to reproduce itself, sending a team of people to yet another Anglican church. Ric and Louie have a vision to see this kind of revival spread throughout England, and in fact Ric is moving into a new role that will allow him to focus on church planting. But what about the Muslim community? I hadn’t heard much about inroads there. When I talked with Louie in the entryway to St Paul’s a few weeks ago, though, I was excited to hear that I had come at the perfect time to get a glimpse into new developments with the church’s Islamic neighbors. The flurry of activity before the service was even greater than normal because the church was getting ready to host a luncheon that afternoon. St Paul’s had joined with three other churches and one mosque to begin a series of meals together. They had met for the first meal at the mosque, and now the second meal would be held here at St Paul’s. Louie made a few arrangements so that I could attend. After the service, church members rearranged chairs in the main sanctuary, brought out tables, and decorated with banners and pictures of their community. As guests arrived, they could have their picture taken with a chalk board upon which they could write something they liked about the Shadwell community. I found myself at a table with Ric, a couple of members of St Paul’s, a Muslim woman, and four bearded Muslim men. A few of the representatives of each faith community welcomed the guests. Ric told the story of the Good Samaritan, explaining that we all wanted to understand how to become better neighbors. A young man then directed our attention to a sheet of paper on each table. The paper contained questions for us to answer, such as what do we like best about Shadwell, how long have we lived there, and how many chicken-and-chips shops can we name in the neighborhood. When the bearded men sitting across from me heard the words, I could see them smile. One of them said, excitedly, “This is what we say, As-Salamu Aleykum. May peace be upon you.” They joined in with the singing. Members from each faith community could then get up and make brief announcements. One young Muslim woman, wearing a hijab head scarf, invited everyone to attend a group she led that worked for human rights in the region. Louie got up to invite mothers to the “Mums, Tums, and Little Ones” group that meets at St Paul’s. I left St Paul’s wondering what that fun day might look like. I pictured the young lady in the hijab working with Louie to arrange games that the kids of secular young families would play. If believers wonder how the divide between them and the people of other faiths around them can possibly be bridged, the story of St Paul’s Shadwell shows that this kind of teamwork is not an impossible dream. With enough faith, perseverance, and respect, it can actually happen. What do you think about the St Paul’s story? Does it give you any ideas for how believers in Jesus can form partnerships with people of other faiths? Please share your thoughts with me at my Facebook page or on Twitter.